Former hit singer Hollis is down on her luck after the Crash and can't turn down the offer of a job again from mysterious global ad agency, Blue Ant. Stanley Milgrim, ex-addict freshly out of an expensive rehab paid for by Blue Ant-founder Hubertus Bigend, is also on the payroll. Bigend wants them to do some discreet research on an a secret, obscurely fashionable denim. It may not matter that they know nothing about fashion - but it does matter, at least to them, when bullets start to fly and they realize that Bigend's business obsession is leading them down a dangerous path. 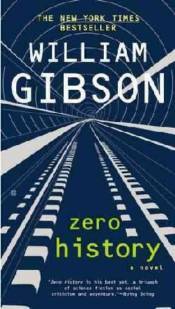 Set among London's dark and tangled streets, "Zero History" is a brilliant thriller about the webs and networks of the new century.